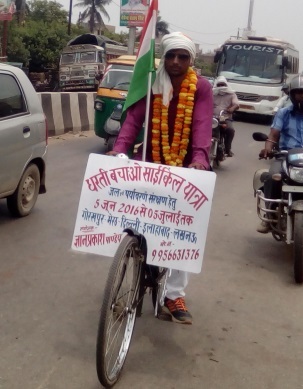 Dharti Bachao Cycle Yatra (Save Earth Cycle Journey), a one man initiative to raise awareness for protecting Mother Earth, started today from Gorakhpur, Uttar Pradesh. The Journey is being undertaken by Mr. Gyan Prakash Pandey and is being provided social media support by Delhi Greens in collaboration with the Earth Day Network. The Cycle Yatra will cover 30 districts of India in 30 days and the theme of this Yatra is to sensitize people about saving water, conserving and growing more trees, stopping open defecation and related sanitation issues. The Yatra was inaugurated today on World Environment Day 2016 after which Gyan Prakash Pandey began the month long journey. 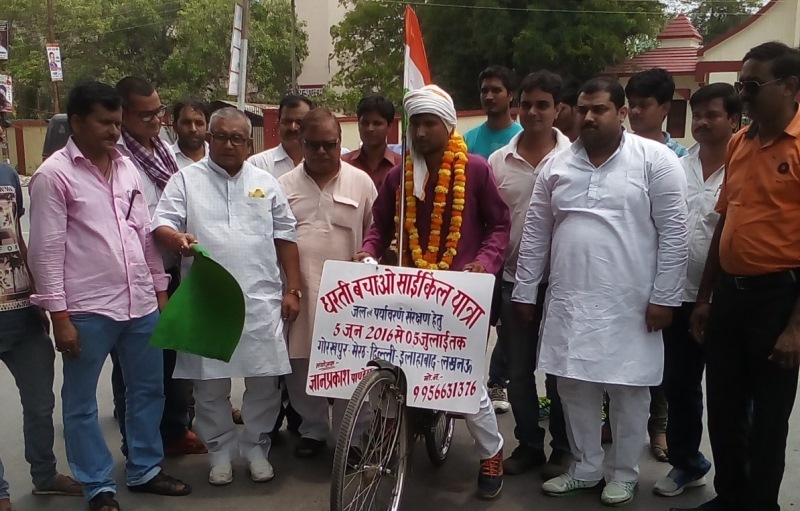 The Dharti Bahaco Cycle Yatra was flagged off by Mr. Seetaram Jaiswal, President of Sanyukt Vyapar Mandal of Gorakhpur. Mr. Someshwar Pandey, Convener, Rapti Sanskriti Sanraksharn Nyash, Gorakhpur and Mr. Rana Rahul Singh, Convener of AIIMS Sanghrash Samiti Gorakhpur were also present to flag off the Cycle Yatra. The journey was flagged at 11.00 am from DDU Gorakhpur University Gate. From here, Mr. Pandey reached Sant Kabir Nagar District Headquarter at around 5 pm. He has halted for the night here and will be leaving for Basti tomorrow (6th June). The key cities touched by this cycle yatra are Meerut, Delhi, Allahabad and Lucknow. The Cycle Yatra will also attempt to meet district officials and make them aware about environmental issues while simultaneously urging them to carry out more and more tree plantations, ensure water and energy conservation, try to shift to renewable energy, ensure sanitation in the entire district, promote organic farming with farmers and strengthen PRI’s for better implements of schemes. We wish Gyan Prakash Pandey the best of wishes for venturing into this journey for a noble cause and will keep updating with his journey milestones from time to time! More power to pedal power!